This protocol can be used to titer lentiviral preparations that carry a fluorescence marker. Determining the titer of your lentiviral vector allows you to control the multiplicity of infection (MOI) in downstream studies. This protocol was developed for Lenti-X 293T cells but can be adapted to a variety of target cell lines and selection markers. Note, because this protocol uses microscopy to determine the percentage of fluorescent cells, these cells can still be used in downstream applications. To a 500 mL bottle of DMEM high glucose, add 55 mL of heat inactivated FBS and 11 mL of 200 mM L-alanyl-L-glutamine. Store at 4℃. *Pro-Tips* Different brands and lots of FBS can promote or inhibit transfection. Test a variety of brands and lots of FBS to find one suitable with your protocols. FBS can be purchased already head inactivated or it can be inactivated in the lab by heating to 56 ℃ for 30 minutes. The health of the the target cell line is critical for obtaining accurate titers. Do not over or under-grow your cells. Thaw a new vial of cells after 20-30 passages. Do not add penicillin/streptomycin to the media. Titer will vary between cell lines. It is not recommended that lentiviral supernatants be subjected to multiple freeze-thaw cycles. Seed 75,000 cells into each well of a 6-well dish. Prepare a batch of cells as follows: Dilute 525,000 cells into 14 mL of DMEM complete. Mix well by pipetting or inverting. Aliquot 2 mL of cell suspension into each well of the 6-well dish. If using freshly collected virus, filter through a 0.45 μm polyethersulfone filter to remove cells and debris. Lentiviral titer can decrease during cycles of freeze-thaw. If you are freezing and aliquoting virus, it is recommended that you titer from the frozen stock to account for any loss in titer associated with freeze-thaw. If using frozen virus, rapidly thaw the lentiviral aliquot at 37℃ by agitating in a warm water or bead bath. Prepare dilutions of the lentivirus into DMEM complete containing 10 μg/mL polybrene. Note, this protocol was developed using low titer lentiviral vectors (105 TU/mL). If you anticipate that your viral stock will be higher titer consider additional dilutions. Gently aspirate media from the cells. Add 1.5 mL of a viral dilution to each well (each well gets one dilution with one well left over). Count the cells in the remaining well, a cell count is required for calculating the titer. Gently aspirate media and replace with 1 mL of PBS. Calculate the percent of fluorescent-positive cells in each well. When calculating titer, only consider wells with less than 40% fluorescent-positive cells. Titering methods assume 1 integration event per cell. When the percentage exceeds 40% you risk counting cells with multiple integration events leading to underestimation of the true titer. For a more accurate titer, take the average of multiple dilutions. Figure 1: Lenti-X 293T cells were transduced with a range of dilutions of 64108 pHAGE-TO-dCas9-3XmCherry. 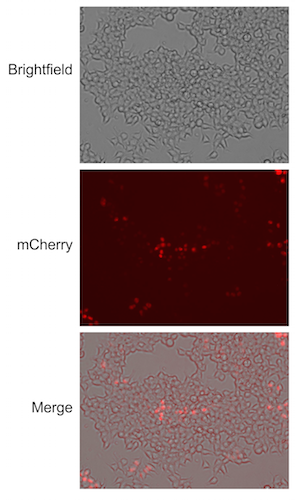 72 hours post transduction, cells were assayed for mCherry expression using fluorescence microscopy.